The College Board met this week and embarked on a strategic planning review to determine future opportunities for St Patrick’s Technical College. The review is looking at the possibility of new course offerings, the need to keep pace with changes to VET and skills delivery and how our partnership with TAFE SA might be enhanced. Other partnership opportunities are also being explored, particularly with industry in an attempt to fully meet their needs. This is an ongoing process and one on which I will keep the College community updated. One of the matters also being discussed is the development of a 360 degree survey to involve all our families and stakeholders. The Board would welcome comment or feedback on the direction of the College. The AGM of Northern Futures was held this week and I was re-elected for a further term on the Board. Northern Futures is a not for profit organisation which is funded by both the State and Federal Governments, and whose mission is to connect young people and the unemployed with job opportunities in the northern areas. This involves counselling, training courses, careers advice and development programs. Northern Futures does much work in schools in the northern suburbs and, like St Patrick’s, links with industry to provide employment outcomes. Northern Futures has offices and training rooms at the Elizabeth and Salisbury shopping centres and is open to anyone seeking employment advice and support. The first Open Day for this year is on this Sunday at the College. This is our major showcase occasion and existing families are welcome to attend. I would encourage you to let any perspective families know so they have the opportunity to see what is on offer for young people in a trade focused school environment. Industry engagement with the College is still strong with many apprenticeships on offer at the present time. There are currently eighteen apprenticeships listed on the apprenticeship notice board adjacent to the Industry Office. These are across a range of industries with many in the various building trades. Students need to keep an eye on the apprenticeship board as it is constantly updated as employment opportunities arise. Students seeking apprenticeships need to speak with College Industry Relations Manager, Mr Jim Montgomery, to get an application process under way. The total apprenticeships obtained by the College for students since 2008 now stands at more than 560, with many more being achieved after graduation. We are grateful to our industry partners who have made this possible. We are currently in the season of Lent and Easter is fast approaching. This is a major feast in the Church when we celebrate the death and resurrection of Christ. During lent we prepare for Easter through acts of reflection, prayer or denial. This also coincides with the Vinnie’s Winter Appeal and we are supporting this in our College with the collection of clothes or blankets which can be deposited in the Vinnie’s bins located in the foyer. Please support those who are less fortunate in our community at this time. This entry was posted in Principal's Blog on 27/03/2014 by St Patrick's Technical College. St Patrick’s has continued to excel in sustaining apprenticeship intake numbers at ASC Shipbuilding (ASC). 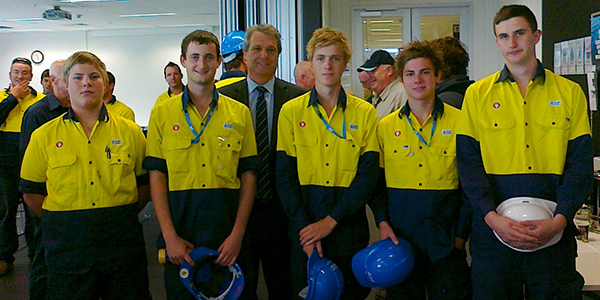 Five of the 23 apprentices who commenced in 2014 were students from the College. Since the ASC commenced their apprenticeship program in 2010, St Patrick’s has provided 14 apprentices – approximately 20% of their total intake. The employment of apprentices at ASC is extremely competitive with approximately 800 applications being received when recruitment is advertised every year. We are fortunate to have an excellent relationship with ASC and they are prepared to send their senior trade executives to the College to make a presentation when apprenticeship opportunities are advertised every year. Students are not only given information on the company, what they do and career opportunities within it, but also what apprenticeships are available and how to apply for them. examples of work and / or projects they have worked on. Mason Browning, Electrical (’14 Applied Engineering). Mason, who is completing Year 12 this year, is the only school-based apprentice in the group of 23 apprentices. College Principal, Mr Rob Thomas, and Industry Relations Manager, Mr Jim Montgomery, attended the 2014 Apprentice Program Event at ASC, Osborne, where the 23 newly appointed apprentices were welcomed into the organisation by ASC Chief Executive Officer, Steve Ludlam. Mr Ludlam stated ASC’s apprenticeship program represents one of the largest in the State and the newly appointed apprentices will be part of the most advanced manufacturing facilities in world and the apprenticeship represents the commencement of an exciting career. This entry was posted in Industry Office, Latest News on 17/03/2014 by St Patrick's Technical College. This week Mr Bruce Hall, College VET Manager, was involved in a VET Forum with the Federal Industry Minister, Ian MacFarlane. The aim of the Australia wide round table discussion is to seek input from VET professionals about the level of industry engagement in education across Australia. This is part of the broader debate about productivity, skill acquisition and apprenticeships which is taking place at the present time. Mr Hall presented the Technical College model as one which successfully engages trade orientated students in their learning and links them with industry. Multi-trade sites, such as ours, have a higher apprenticeship success rate and are valued by employers for a more holistic approach to making students employment ready. This has been borne out by our apprenticeship numbers which currently stand at 563. We have been invited to participate in future forums. Along with Mr Jim Montgomery, our Industry Liaison Manager, I attended the induction of the new apprentices at the ASC at Techport this week. This event which has TAFE SA, industry and education representatives, was a great affirmation of manufacturing in South Australia. Five of the twenty one new apprentices at ASC in 2014 come from St Patrick’s which is a source of great pride. Overall a quarter of the eighty one ASC apprentices are former St Patrick’s students. ASC has one the largest apprentice cohorts in the state and provides a long term manufacturing and quality skills base for SA. We will continue to develop the relationship with the ASC to promote future opportunities for our students. There have been two new appointments to the St Patrick’s Technical College Board: Mr Michael Olszewski, State General Manager of Stratco and Mr Sean Holden formerly of the Resources & Engineering Skills Alliance (RESA). Both of these men bring vast industry and management skills on to the Board and ensure that our College has strong and ongoing industry links. We are celebrating St Patrick’s Day on Monday. The day begins with a liturgy and there will be gala day activities which will finish with the annual Inter-Trade Tug-o-War. Students will be dismissed at 2.40pm. This is a day in which we celebrate the feast of our patron saint and come together as a community to acknowledge who we are. This entry was posted in Latest News, Principal's Blog on 12/03/2014 by St Patrick's Technical College. This week the College was represented at a Defence Force Recruiting ‘Influencer Tour’ to HMAS Stirling. 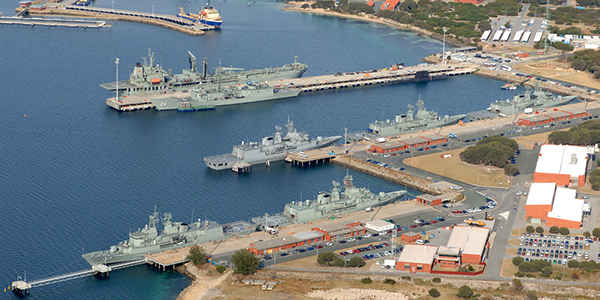 Stirling is the Royal Australian Navy’s Fleet Base West, located at Garden Island, near Perth, WA. St Patrick’s Technical College Business Development Manager, Mr Patrick Kelly was joined by representatives from a number of educational institutions from around Australia that are delivering programs identified by Defence Force Recruiting as having specific relevance for careers in the three arms of the Australian Defence Forces. Also from South Australia were Mr Pete Chambers representing our sister school Marcellin Technical College, Christies Beach, and senior lecturer from the School of Electrical and Electronic Engineering at the University of Adelaide, Dr Braeden Phillips. Day two had a strong focus on trade careers in the RAN with a tour of the trade warehouse workshop and the Electronics Technician and Marine Technician work areas. Visitors were also fortunate to be taken on guided tours of HMAS Toowoomba before it set sail for a 6-month tour of duty in the Middle East..
St Patrick’s has a strong link with employment opportunities in the Australian Defence Forces. Significant numbers of our students have been employed by defence industry employers including BAE Systems, Raytheon, Levett Engineering and the Australian Government Defence, Science & Technology Organisation (DSTO). And as had been publicised widely this year, including by their Chief Executive Officer, Mr Steve Ludlum, at the recent Australian Defence Business Magazine conference in Canberra, St Pat’s has produced a large number of apprentices for ASC working on both the Collins Class submarines and the new Air Warfare Destroyers (AWD) at Osborne. Students should also consider that the Navy, Air Force and Army themselves are viable pathways to pursue a trade career. Many students, upon completion of their Year 12 at St Patrick’s have already taken this opportunity and we are sure that many more will continue to do so in the years to come. Defence Force Recruiting have already visited St Pat’s once this year with information on this pathway, however to learn more students can contact the Industry Office or their Pastoral Care teacher. Images of the tour can be seen on our Facebook page. This entry was posted in Industry Office, Latest News on 05/03/2014 by St Patrick's Technical College.